It’s Frosso from Lacquer Me Silly here saying hello and taking over Amy’s space. I’m super happy to have the opportunity to guest post on The Fancy Side! 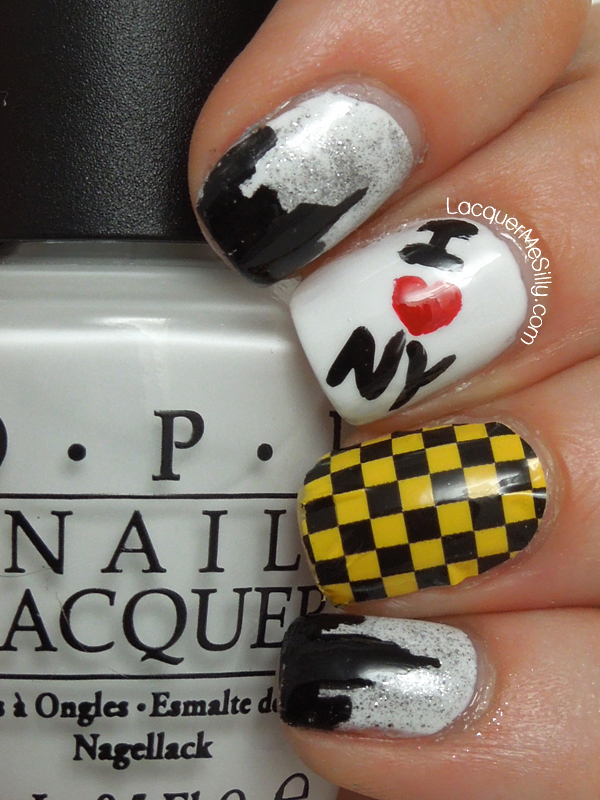 Since Amy will be making a big move to New York soon I decided to create a NYC themed mani for the occasion. Pinkie and Index – I started with a white canvas using OPI My Boyfriend Scales Walls. Then I VERY LIGHTLY sponged on OPI Lucerne-tainly Look Marvelous for some dirty sparkle because what’s NYC without a little dirty sparkle? Then I free handed a silhouette of the NYC skyline with OPI I Only Date Werewolves. Middle – OPI MBSW was used as the base white. 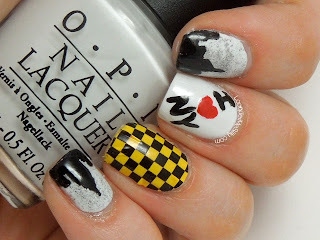 I then free handed I <3 NY with OPI I Only Date Werewolves and SOPI Pushing Your Luck. Ring – I used one strip of Sally Hansen Salon Effects in Sound Check for an iconic taxicab checkered print. I hope you enjoyed my ode to NYC mani, I had a fun time creating it which is surprising since free handing scares me a bit! Thanks again Amy for letting me take over your corner of the Internet ;) Good luck on your move and welcome to the tri-state area! I love Frosso! She has the cutest manis and this NYC themed one was the perfect way to welcome me to the city! I'm also lucky that she's a train ride away, so you'd better believe we are going to have some polish fueled shopping sprees in our future! Be sure to pop over to Lacquer Me Silly and say Hi! You have to get back home and start mapping out all of the nail places so we can top the great nail haul of Lesley and Cynthia '13. I'm working on it. I figured out where they sell Cirque polishes! Can we go there? PLEASE!!! Isn't it? She did such a wonderful time. and by time I meant "job" dork alert. You better believe no one is going to top the polish spree of 2013. I'm trying to recall how many total polishes I purchased but with our loot combined, we might have purchase around 60 bottles maybe? Plus assorted nail stuffs...you ain't beating that. This mani is so freaking cute. Good job! 60?! .... start saving your pennies Amy! Jesus H Christ....60? I don't think we're going to top that. Fross did an AWESOME job!!! Love it! The free hand skyline is just perfection! I love what she did! So cute. 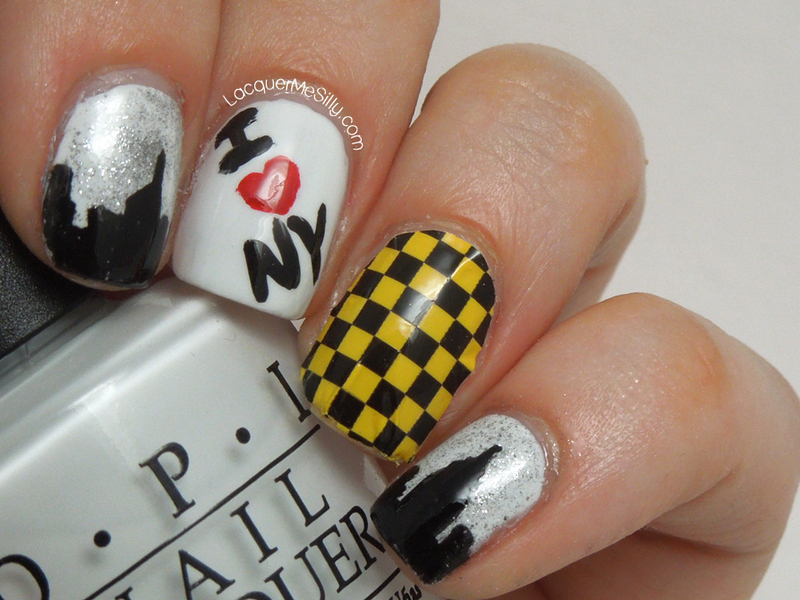 ahh i love the skyline and also the checkerboard nail! Didn't she do a wonderful job? It's so cute. This is so cute! Great job Frosso!